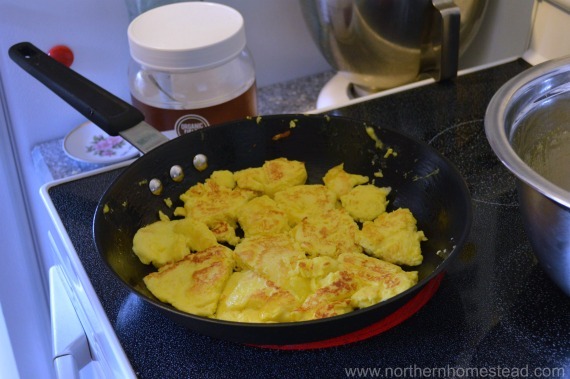 You have never heard of scrambled egg pancakes? Me neither, I just came up with this name for a very old traditional food. 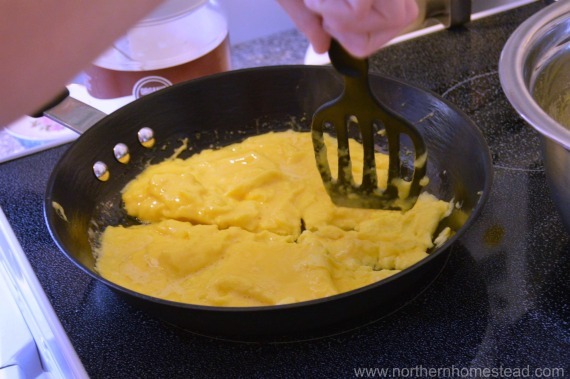 In my family we would just call it scrambled eggs from Oma. This has been a favorite Sunday lunch in my husband’s family. It is not just scrambled eggs, it’s more yummy, more filling, almost like a cake, but so simple to make. I thought Scrambled Egg Pancakes sounds good for it. Or just go with scrambled eggs from Oma ;). We love Oma and her yummy recipes. 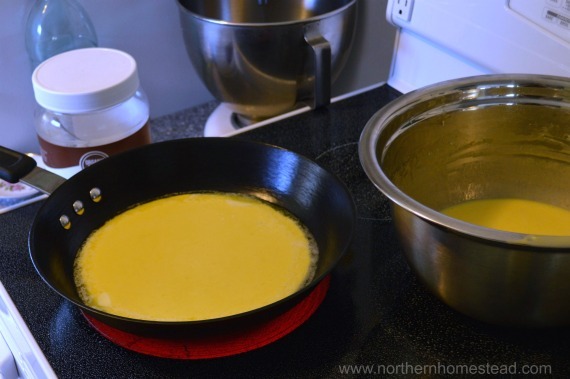 We took lots of pictures so you can see how to make the scrambled eggs pancake, it is not complicated maybe just a bit different. I find preparing two portions at a time works best. 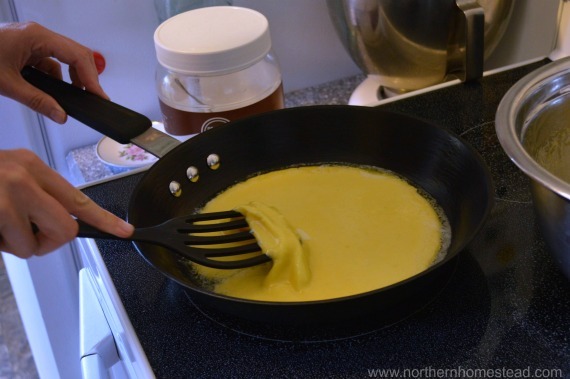 You sure can make as much batter as needed, but don’t put everything in a pan it ones. As soon as you see the batter thickening at the bottom of the pan, start lifting the cake so that fluid from the top can go to the bottom. Keep doing it till all the eggs are thickened. This will make the scrambled egg pancakes fluffy. Now divide the cake into pieces and turn it. Divide into some more pieces, as many and as small as you want. Keep turning so everything is golden brown. 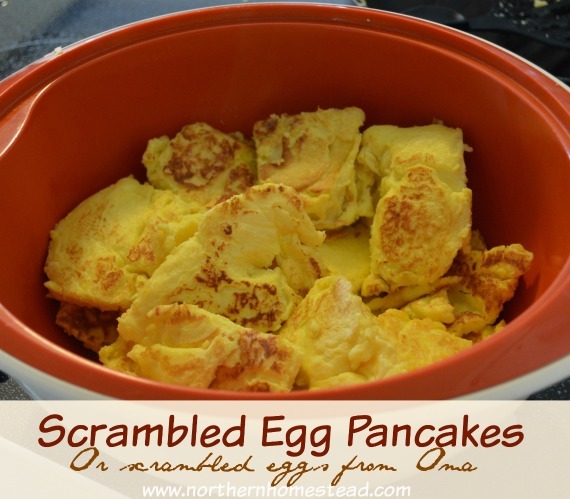 Serve with anything you like your scrambled eggs or pancakes with. Enjoy. As soon as you see the batter thickening at the bottom of the pan, start lifting the cake so that fluid from top can go to the bottom. Keep doing it till all the eggs are thickened. This will make the scrambled egg pancakes fluffy. Divide the cake into pieces and turn it. Divide into some more pieces, as many and as small as you want. Keep turning so everything is golden brown. You know something? I’ve dined all over the place – San Francisco, Paris, the American south, London, rural Russia. You think I’d have some high faloutin’ tastes but my absolute favorite food is eggs, scrambled usually. I’m totally making these!!! I hear you Tessa, I often crave eggs, so yummy and good for you! Hope you like the recipe. This looks like something I would like. 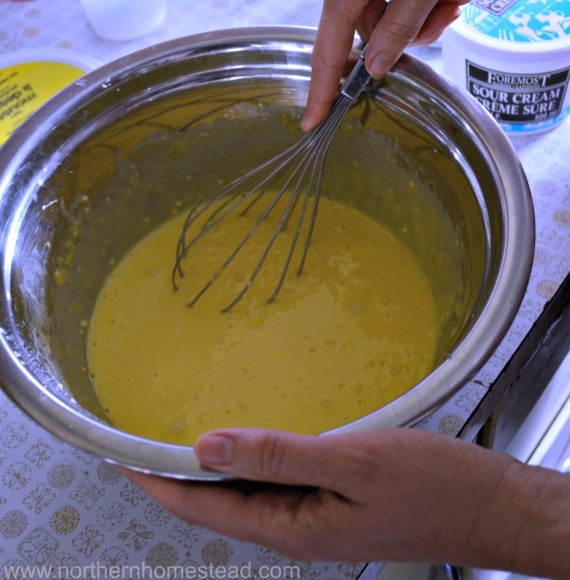 I want to try it with rice flour and coconut oil to make it gluten and dairy free! I shared this on my Family, Home, and Health facebook page! Thank you for sharing Kristie. This sounds yummy for someone who can’t have gluten and dairy. Hi Anna! I’m stopping in from Let’s Get Real today. 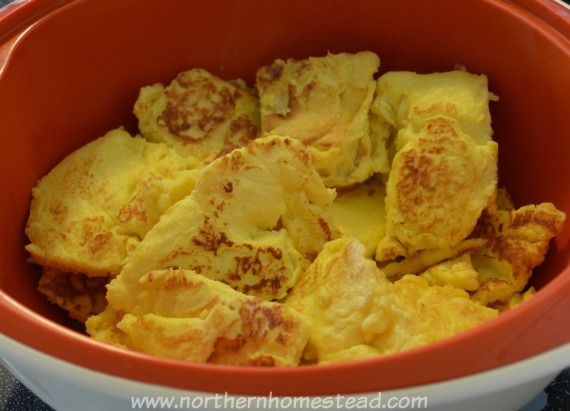 My kids love scrabmled eggs so I can’t wait to try out Oma’s scrambled egg pancakes. It sure does look delicious and fun to make. I might even have my daughter make these for us. What a blessing to have kids make meals for you! Enjoy and hope you like it. We call this dish an omlette over here, filled with cheese and bacon it makes a warming and tasty meal. Oh yes, we like omelets too, with onions and peas is my favorite. But I do not put flour in omelets, But you are right it is similar. We do have the recipe for Kaiserschmarrn, too. So good. Hope you got to make some for you, enjoy!